Place chopped strawberries in a food processor and puree. Place pureed strawberries in a pot and simmer until reduced by ½. Strain through a fine mesh and while still hot, add 4 cups sugar and ½ tablespoon salt. Combine well, allowing sugar to dissolve. Set aside to cool completely. Put eggs in a mixer with a whisk attachment. Whisk until light and fluffy. In a pot put 1 cup of sugar and add enough water to achieve the wet sand look. Cook to 238 degrees and then remove from heat. Pour sugar mixture into eggs while eggs are whisking on slow speed. Allow to whisk until mixture has cooled to room temperature. In a separate bowl, whip heavy cream to SOFT peaks. Fold cooled eggs into cooled strawberries. Fold whipped cream into strawberries. Wrap parchment paper around your vessel so the paper extends above the rim by 2 inches. Secure with a rubber band. Pour mousse into vessel, portioning about 1 inch above the rim. Allow to setup in freezer for 24 hours before serving. 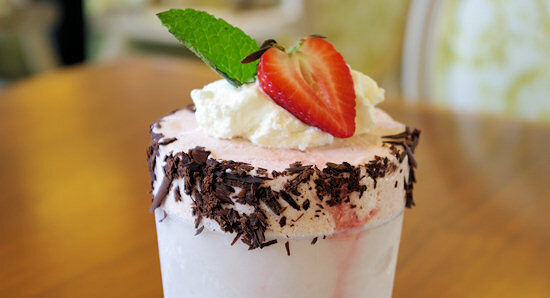 Garnish with fresh whipped cream and a strawberry.